“You and Your Research” is one of my favorite lectures on the scientific process. In it, Turing Award winner, Richard Hamming, speaks about the importance of selecting the right problem. This key idea turns out to be of massive significance in the investing process as well. 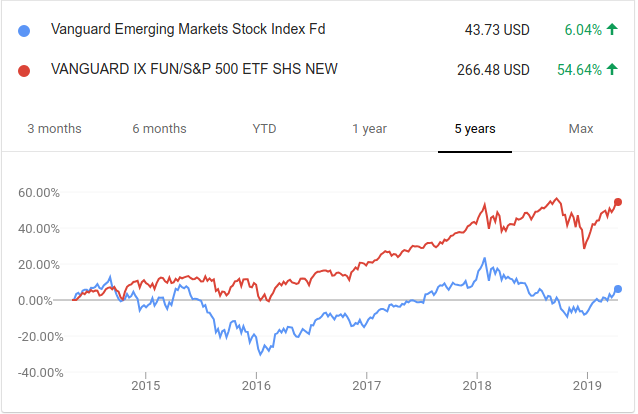 As widely known, US markets far outperformed emerging equity markets. However, this is only part of the story. Of greater interest is the outcome of actual investors in these markets. While we can’t actually study individual investor results, we can look at the distribution of mutual fund returns in each space. As expected the median Emerging equity fund did worse than the median US equity fund. However, that’s just the tip of the iceberg. Here’s the real news headline: Even the best emerging equity funds performed worse than the worst US equity funds. Let that sink in for a bit. The pond we fish in matters more than how smart or hard we fish within the pond. The go-anywhere investor truly does have an advantage in the modern world. The relative amount of outperformance in US equity markets is lower than the relative amount of underperformance. This is probably due to fees and expenses. Too often in investing we concern ourselves with performance numbers and results without taking into context the environment in which they were achieved. Performance only ever makes sense in context. But perhaps the most important question is the following: Given that markets are mean reverting over the long run, how will the next 5 years be for these groups? Fishing where the fish are was published on Apr 15, 2019 and last modified on Apr 15, 2019 by Pranesh Srinivasan. © 16048 Pranesh Srinivasan. Powered by Hugo using the Minimal Mistakes theme.